1. Create a signature body of work. What makes your art different? Do you have a unique style, with that “extra something”? When people see your art, do they recognize it as yours? You make an impact when your body of work stands alone and is memorable. 2. Make a plan. Carefully craft a vision for your art business, and set viable goals. Focus on just a few things, because going in too many directions will waste your time and drive you crazy. When you start a new project, think, “Does this advance me towards my goal? What results do I want from this? What contacts will I make – and how will I follow up with them?” When you pursue your business plan with focused intent, you will break out from the large group of artists who don’t have focus, and won’t get noticed. 3. Do some networking. Most galleries find artists through referral from artists, curators, and others. Attend openings and other art events. Join a guild or arts group, or start your own artist salon, but make friends and build relationships with people. As you help others whom you network with, they will help you also. And quite often it’s true that it’s who you know that matters. 4. Design a professional website. Use professional photography that shows your art to its best advantage, including in situ photos, and even videos. Make your website “About” page compelling to read, and your site easily navigable. Most artists don’t have exceptional websites, so when your website makes people say “Wow!” you immediately stand out and make an impression. Check out examples here, here and here. 5. Brand yourself. Some people hate this term, but it’s true that if you have a consistent look to your presentation – marketing materials, website, etc. and you have a consistent voice, it will make an impression on others. 6. Act professionally. This is a no-brainer, right? But it doesn’t always happen. Set yourself apart from your competition with a totally professional approach – which has a direct effect on how seriously you are taken. Respond promptly to your emails. Give excellent customer service at all times. Be prepared to give a presentation designed to impress – and you will. 7. Keep track of your progress. Install Google Analytics on your website. Note your follow ups to networking contacts. Measure progress you’ve made with your SMART goals. And keep your strategy flexible enough to incorporate new markets or opportunities as they arise, so you can take advantage of them. 8. Shine on social media. You can’t do it all. Choose one or two that work for you. If you like LinkedIn for instance, proactively make contacts there and start conversations. Join discussion groups, ask questions, and search for connections you can work with. As you build relationships there, approach others about collaborating, becoming strategic partners, or doing business together. 9. Become a leader. Quite often, artists who get noticed and respected have gotten there because they take the initiative. As you work with intent on your business, you can come up with creative ideas for innovative projects to spearhead or groups that you can inspire. The energy and the buzz created by leaders and innovators draws notice, followers, and business visibility. 10. Stay open to new ideas. Artists with vibrant businesses that stand out stay on top of new trends and techniques to share their work. They remain relevant to their customer base, open to feedback and ways to innovate even further. You probably know some of these artists, because their names show up in the press and their ideas get noticed. Author Carolyn Edlund is the founder of Artsy Shark and a business consultant, helping artists and creative entrepreneurs market and sell their work more effectively. Find out more here. This is a great article full of very valuable tips and nuggets that can very well help to grow your business! Thanks for all that you provide! My pleasure Tariq – thanks for reading and subscribing. I speak to artists every day and look at their websites. There is a definite divide between people who are “in the pack” and those that stand out because of the way they treat themselves and their businesses. If you want to be a star, you need to look and act like one – like “Dress for Success” ! Excellent list. Having a long term plan is something I’ve only just started thinking about for my art. Vandy, I think every artist needs a long-term plan. It helps you understand where you are going, which then allows you to create a roadmap to get there. Joanne, Your idea of an article on the demographics of each social media platform is excellent! You are putting me to work on some research … I’ll post it when it’s ready! Thank you so much Carolyn! I’ll look forward to it. Great article! Good points and good links:) I just added myself to your email list. Glad I found you! Welcome Bonnie! 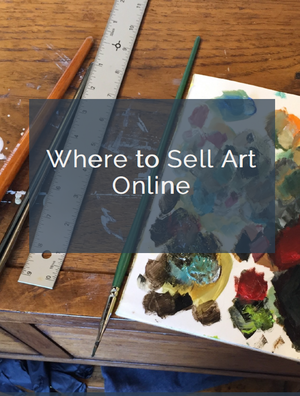 There are hundreds of articles on the business of art on the site. Enjoy. #2-once i focused just on my drawings and made a plan, things really changed and i started selling more art! #3-your last sentence i think, after reading about many famous artists, is truer than true!!! Even in Seven Days in the Art World, in her last chapter, it talks a bit about how they choose artists for each pavilion…it’s who you know! Yes it is, and there are definitely ways to meet the right people, and connect and build relationships with them so that they can help your art business. That takes networking. One key thing that many artists (and other people) miss when networking is that it’s not all “me,me,me” it is about helping others and offering value to them first. Smart networkers plant many seeds out in the world where they have been helpful, given referrals, shown up and promoted others. These come back to you. Wow–that Dale Carnegie quote hit me like a slap in the face. I’ve been trying sooo hard to make connections, but must confess, I’ve been focusing more on me than others. As one who finds it a bit difficult to put myself out there to strangers, this viewpoint allows an entirely new direction to pursue. I am going to decide on two local artists whose work I truly admire, and support them, go to their openings, and follow them on social media religiously. (Without asking for anything in return.) Thank you for your insights, Carolyn. Janet, I applaud you for reaching out to others. At the same time, be open to receiving. A wonderful book with great insight about effective networking is “The Go-Giver” by Bob Burg and John David Mann. I recommend it highly. Great advice, Carolyn. many thanks to you and those who allowed you to share their websites, they give me great ideas for keeping my site clean and simple! Carolyn, thanks for reminding me of many points that seemingly take a back seat when I’m in the midst of creating art! I’d like to share them with my readers, as well as use them as a reminder to myself to stay on task! Great inside knowledge of how things work.Thank you Carolyn. For me, this post outlines things I like to think I already “know” (and try to do). However, in both business and in life, one occasionally hits road-bumps and needs the confirmation/reinforcement. –I needed the confirmation/reinforcement contained in each one of these points. Printing out and taping above my workbench and in my office. Thanks for such a nice comment, Tamra! I agree – quite often there is something that you “know” intuitively and when you read it, it makes perfect sense. I quite often have that experience when reading articles from other bloggers and artists.